A place where teens can explore their interests in programming, film-making, music production and design. Our space will have professional recording, mixing, editing, and video equipment, green screen, vinyl cutters, sewing machines, button makers, and 3D printers. Plus Adobe Creative Cloud access for our members and mentors. Mentors will work alongside teens, sharing their skills and knowledge and creating a resource for members. 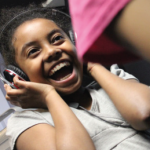 Members (ages 10 to 17) spend their after-school hours producing songs, constructing 3D models, making their own animations and videos, building websites, and much more. Days, weeks, even months are spent on projects that they find personally meaningful. Through their participation, members develop skills that help them reach personal, educational, and career goals. Mentors are professionals and college students in art, music, engineering, education, and many other diverse fields. They are available to answer questions, provide inspiration, and help create an atmosphere of mutual respect and trust. Just by being there and being themselves, mentors make a real difference in the lives of Cleveland youth. The Clubhouse Network is a program of the Museum of Science, Boston in collaboration with the MIT Media Lab. © 2018 Best Buy. All rights reserved.